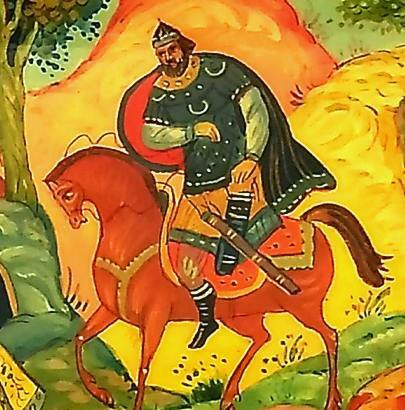 The evil Farlaf on horseback approaches the sleeping Ruslan and Ludmila, and will soon thrust his sword into Ruslan's side. Not the end of the story, of course, and if you would like to read the whole tale of Ruslan and Ludmila, click here. 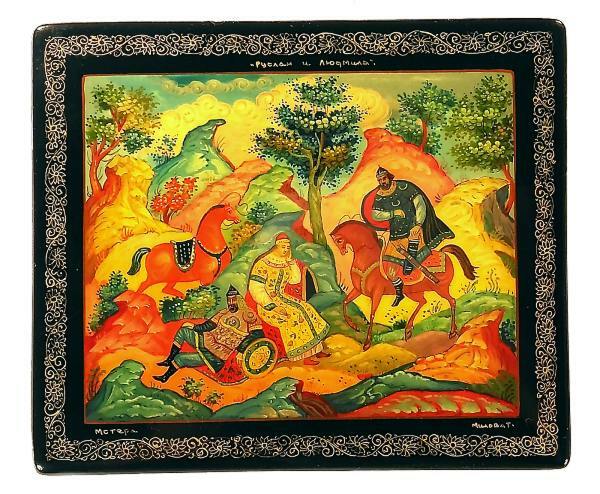 The box dates back to 1987 and was done in the highest traditions of the Mstera village by lacquer box artist T. Milova. The details on the people are good and stand apart from the more general flow of the pastel colored landscape. There is a traditional gold ornament around the top and another one around the sides. The lacquer on the top and bottom of the box is relatively smooth for its age, while the lacquer on the side has a a texture to it. The box is made out of high quality papier mache and has a hinge. The interior is red. Signed by the name of the artist, village and title. A "Made in USSR" sticker is attached to the bottom of the box. There are a couple papers included inside: one stating that the box was painted for Lucy Maxym collection, and the other a paper from the old USSR giving a few basic facts about the box, including the year, 1987.